Some device manufacturers support several types of apps. For example on a Samsung TV you can run Tizen apps as well as HbbTV apps. Suitest allows for configuring several platforms on the same physical device. To add a platform open the device detail page and press Add platform button. Device wizard will launch offering you to select another platform for the device. 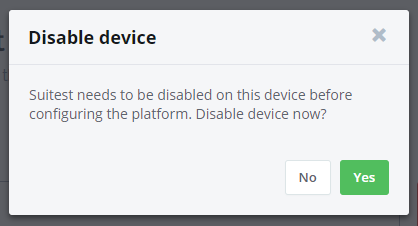 The device needs to be disabled before the new platform can be configured. Suitest will ask to disable the device if necessary. Currently Suitest does not support combining Android TV platform with any other platform. Support for this will be added in the future.